* If you are Medicare eligible, COBRA is not considered credible coverage for yourself. I qualify for COBRA, now what? What if I can’t afford COBRA? We understand that COBRA costs may not be feasible, especially if you have lost your job. If you are unable to apply for coverage through your spouse’s employer or through a new employer, we recommend that you speak with our agents. We may be able to find you more affordable coverage, and can certainly help you navigate healthcare.gov, as you may be eligible for an ACA subsidy. 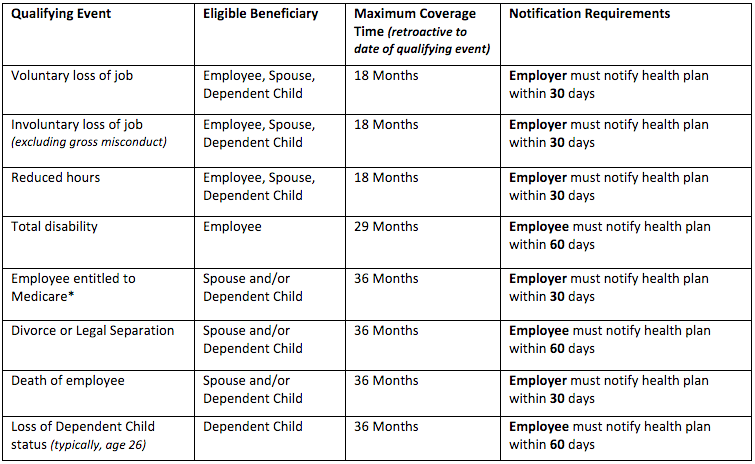 If you do end up choosing COBRA and/or the 60-day election period has expired, you are no longer eligible for a SEP; therefore, you cannot choose a federal marketplace plan until Annual Open Enrollment. The COBRA process can be difficult, and we advise you to reach out to your COBRA specialist or contact the Department of Labor by email at askebsa.dol.gov or by calling 1-800-444-3272, as they will be able to provide you with detailed information about your specific coverage plan as well as the cost to you. Of course, we are happy to assist you with selecting non-COBRA coverage if you need other alternatives.